This article applies to Windows 10 Fall Creators Update (version 1709) and Windows 10 April 2018 Update (Version 1803) . 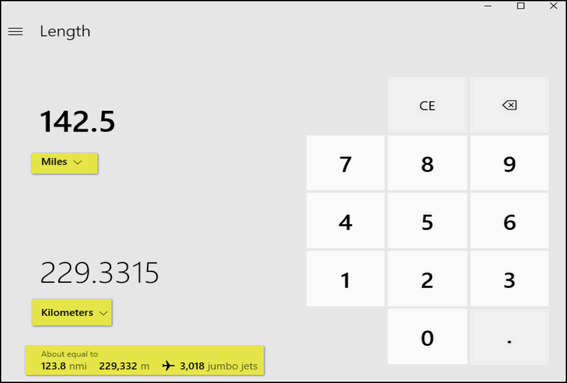 Microsoft continues to improve and refine the Windows Calculator. 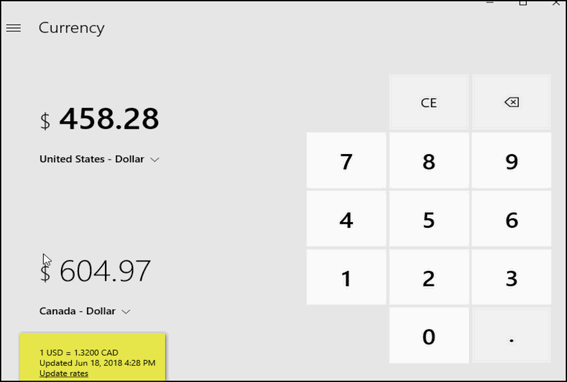 In the Fall Creators Update (and newer versions of Windows 10) Windows Calculator has converters that convert currency currency, length, volume, weight, area, power, speed time, energy and temperature. We’re just going to cover a three today: Currency, Length & Temperature. 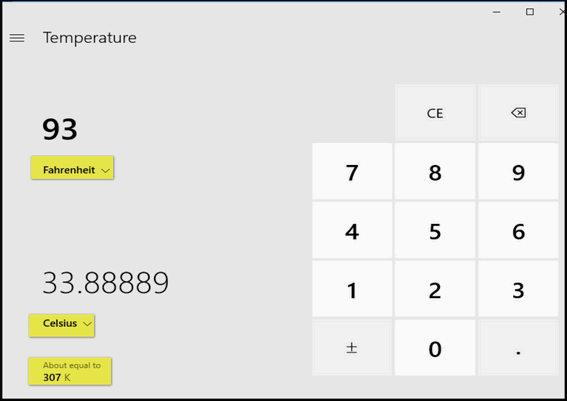 Open the Windows Calculator by typing CALC in Windows search (Cortana) or open a Run dialog (Windows key + R), type CALC and press Enter. Click on the menu icon (3 horizontal lines at the top left) and under “Converter” select “Currency”. Click on the menu icon (3 horizontal lines at the top left) and under “Converter”, select “Currency”. Let’s do currency. Everyone needs to know about money. We know about money because we don’t have any. But it’s fun to imagine. Click on Currency in the “Converter” menu. Choose your currency and the Country/Currency you want to covert your currency to… that’s it. If you want to verify the currency exchange rate, click on the link “Update rates”. Note at the bottom left that the currency exchange rate is current as of today’s date 6/18/2018 or 18/6/2018 depending where you are in this world. Go to a Canadian casino with 100 American dollars and you will get 132 dollars (Canadian) worth of chips. Sounds like a great deal… until you leave the casino with $0.00. And $0.00 Canadian equal $0.00 U.S.D. 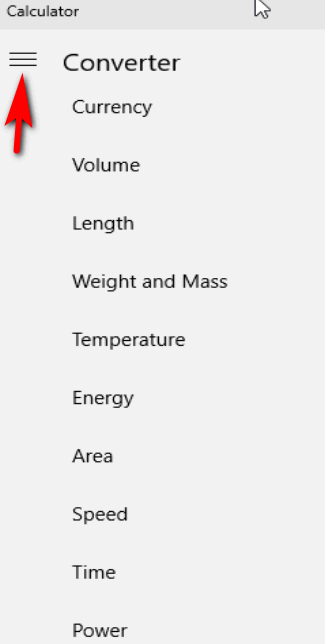 Select “Length” from the “Converter” menu and select the criteria for you conversion (miles, kilometers, meters, centimeters, inches, etc.) and have at it. For this example, I chose to convert miles to kilometers. You can see that 142.5 miles converts to about 229.3 Km. That’s 229,332 meters or approximately the length of 3,018 jumbo jets. I’m not sure how useful that last one is. It’s a hot day here today in my neck of the woods. Which reminds me to tell you that Windows Calculater’s Converter lets you convert Fahrenheit, Celsius and Kelvin. We know that Kelvin is a temperature scale that no one but brainy scientists use – zero Kelvin is absolute zero – and that’s not to be confused with Absolut Vodka. Anyway, it’s a hot late spring here, so I’m converting 93 degrees Fahrenheit to Celsius because it makes it seem cooler 🙂 I see that 93 Fahrenheit is only 33.8 degrees Celsius and that makes me think cooler. I know those of you who never use Fahrenheit won’t agree. Don’t argue with me – let me enjoy the 33.8. We can all be thankful we don’t use Kelvin… it would be 337 degrees here today. So, the next time you have some converting to do, don’t forget the Converter feature in Windows calculator – it’s a great converter and those of you using Windows 10 version 1709, version 1803 or newer, already have it at your fingertips. I don’t think I would have know this was there if you didn’t tell us. Thank you again for great info.